In addition to nerve-wracking weather, one sure sign of spring is the re-emergence of the bicycle as pop culture totem. If you’re on many catalogue mailing lists, you’ve probably seen them — gleaming utility bikes and cruisers at the ready as toned and tanned models relax at the outdoor cafe or by the pool. And they’re not just props — furniture and housewares retailer CB2 has its own city bike, developed with a Florida-based manufacturer ($499; details at Treehugger). Coupled with poll data and legislative action showing general support for human-oriented public space and transportation initiatives, it’s enough to suggest that the bike-hating American public is mostly a myth, conjured and nursed by out of touch politicians and conflict-craving, auto-driven media. Enter Martha Stewart. In advance of Bike Month, Stewart invited Emilia Crotty of Bike New York into the studio for a thorough lesson on cycle maintenance, followed by a bike and schwag giveaway (congratulations Georgiana Powell of Moscow, PA). Turns out Stewart is a cyclist herself, as are, at least for this segment, many members of her studio audience. If this isn’t a marker of cycling for transportation becoming a more mainstream American activity, it’s hard to imagine what would be. This kind of segment is well-meaning but I always wish organizations would bring bicycles more suited to utility cycling when they do these segments. Let’s not present women (me) with a bike that looks like some kind of deeply advanced athletic equipment, save for the fact that it’s pink. I would only ride a pink bike if it came with fenders, lights, dressguard and chaincase, a rack or two so I can carry my life and little son around with me. I also wish they’d say that you don’t *have* to do any of your own bike maintenance to ride a bike. Mechanics exist for a reason and supporting them is good and if you want to learn something you can, and if you don’t want to, that’s ok, too. You can STILL ride a bike for transportation. You do not need to know anything about how a bike works. You do not need to be athletic. You do not need special gear. Suggesting that you do need this stuff is just marginalizing, especially to women. Transportation cycling in the US has truly suffered at the hand of our insane US focus on being “athletic” and geared out at all times. I think if advocacy groups want more people on bikes, especially women, they should make it easier to cycle –not by advocating that you need to do your own maintenance– but by showing that there are bicycles for people who just want to get around. Every cyclist should know how to check the tires to make sure they have enough air, lube the chain, adjust the seat… even women! It is interesting that some of the only useful, substantive and sane reporting on NYC bike issues is coming from the likes of Martha Stewart and Dylan Ratigan while local reporters and editorialists like Grynbaum, Cuozzo, Kuntzman, Peyser and Marcia Kramer focus on trivialities, misinformation and idiocies. What’s that about? What is the local press missing that Martha and Dylan, both also based in NYC, can so clearly see? Whoa, Martha Stewart scooped Oprah?! I’m hoping for a Bike-off. I don’t agree that every cyclist “should” have to know how to do those things. I don’t need special shoes to walk to the subway and I don’t need to know how to change a tire to drive a car. So I don’t really know why I’d need to know how grease a chain to ride my bike. I don’t think emphasizing bike maintenance is the way to entice new riders. YMMV, and I respect that. She has her three bikes (actually 4) in East Hampton. Somehow I doubt she is doing much riding in Bedford where she LIVES. Maybe seeing regular people biking for transportation would be a better marker. Sorry. 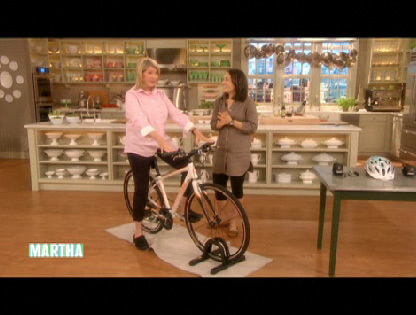 Seeing Martha ham it up a little for a cycling segment (remember, she is an entertainer) doesn’t quite cut it. As a long time recreational cyclist you might call “athletic” (i.e. I was seriously considered bike racing in my early 20s), I’m inclined to agree with you about the maintenance. Sure, I’ve always done and still do my own maintenance but honestly it’s not something I enjoy doing. I just do it because I can’t afford to pay someone to do it to the level I could do it myself (plus the inconvenience of bringing the bike to a bike shop). However, I’ve had a long-term policy of reducing maintenance to the bare minimum by looking for better solutions. Easily 95% of my bike maintenance time was spent changing flat tires. Moreover, flat tires ruined more rides than I care to think about. Therefore, I looked into ways to reduce or eliminate this irritating, repetitive chore. The solution I came upon was airless (i.e. solid) tires. They got a bad rap years ago, but the new ones are much better. Even you’re using a utility bike, chances are good it has 26″ tires, and for that there exist many great airless tire solutions. The latest ones with high-rebound elastomer offer as comfortable a ride as pneumatics, and similar rolling resistance. Even for the 700Cx20 tires I use, I found a reasonable airless replacement. Rolling resistance is on par with pneumatics, or at least that’s what my average speeds tell me because they’re the same as before switching. Ride is slightly rougher, but I’ll take that over having to fix flats on average once a week. After 4500 miles of not having to fix a flat, there’s no way I’m ever going back to air tires. Next up on my list of chores to eliminate is derailleur maintenance. That however depends upon being able to afford ~$1500 for a Rohloff hub. I know cheaper internally-geared hubs exist, but they won’t have the range of gears or the spacing I’m used to. I wish there was a decent solution to the chain as well. At that point my bike maintenance would be practically nil, perhaps checking and adjusting brake cables once a year, or changing out brake pads every few years. And I agree 100% on the special gear. I cycle in street clothes, always have, even though I enjoy fast, athletic cycling. And I don’t even own a helmet, cycling gloves, cycling shoes, shorts, or any of the other parephenalia. You don’t need that stuff to enjoy cycling, either recreationally or for utility. I do tend to think however that good equipment makes a big difference. A faster bike, so long as its comfortable, makes utility cycling all that much easier. It makes trips of longer distances both possible and faster. No need to struggle with heavy, slow equipment like Dutch utility bikes even though some people swear by them. A good hybrid is faster for utility cycling and just as comfortable. Perhaps it’s not as fast as the racing bike I use, but it’s still quite good over long distances, and has a much more comfortable riding position. Comfort in the end is more important. After all, a bike you’re not comfortable on won’t get used much. At 3:05, Stewart clearly says, “What do you think of the bike lanes? I think they’re great.” She brings up the topic, so I’m pretty sure she wanted to put that in there. The thousands that try to emulate Martha do so because of what they see her do on her show, not what they see her do in her private life (there’s an insider trading joke I would make there, if I didn’t think she was the victim of overzealous prosecution, but let’s not get off-topic). If even a small percentage of her viewers contemplate getting out on a bicycle because they saw Martha talking about it, that can have a big impact. And that’s a Good Thing. I agree, but Martha’s whole thing is DIY, hands on. It’s the purpose of her show, and I think its great to set an example for people who might otherwise be afraid to get their hands dirty. The truth is most simple bikes require minimal maintenance beyond keeping some air in the tires. In Europe (here we go again, I know) most people ride around in their nice clothes–suits, maxi skirts, heels, etc., but they have protected bike lanes and cycle tracks, comfortable frame geometries, sheltered bike parking at the train station. Infrastructure that makes everything even easier than it is here. Is the Dockless Bike-Share Revolution a Mirage? There are big questions about the venture-funded dockless bike-share model that go deeper than the propriety of where the bikes are parked.